Please select a model from below to find out more. Click here to view full specification table. 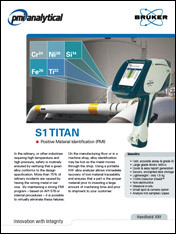 The S1 TITAN series is designed to quickly and accurately report the elemental analysis of your sample. Whether you need to analyze large machined parts, children’s toys, or small jewellery, the S1 TITAN will deliver fast and accurate results. The ergonomic pistol grip and trigger are designed for all-day use. The color touch-screen LCD is easily seen in all lighting conditions. 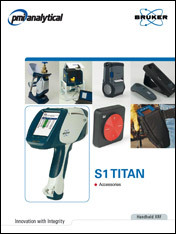 Weighing in at just 1.5kg (3.3 lbs), the S1 TITAN is among the lightest tube-based XRF analyzers on the market. 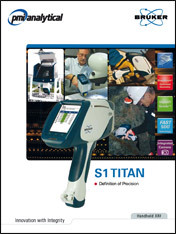 Designed as a “point and shoot” analyzer, the S1 TITAN requires minimal setup and operator training. Equipped with both user-level and supervisor-level access, a manager can choose to grant basic operator control or full functionality. This two tier approach and intuitive interface make the S1 TITAN perfect for both beginning users, as well as power users. Since XRF is a non-destructive technique, it is ideal for analyzing and sorting incoming material, finished goods and in-process production parts. Applications for the S1 TITAN are not limited to clean manufactured parts; scrap metal sorting, geochemical assays and soil testing are also well within the capabilities of the S1 TITAN. Available calibrations are as diverse as the list of applications, but if you don’t find a calibration to match your application, we can customize a calibration to perfectly fit your requirements.